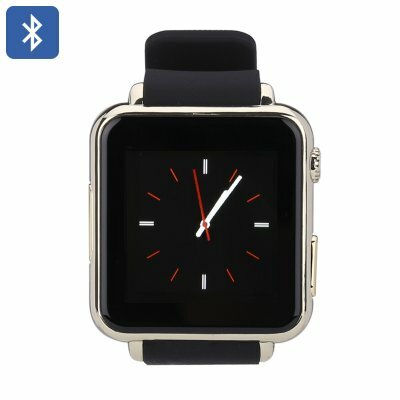 Successfully Added Iradish Y6 Bluetooth 4.1 Phone Watch - Pedometer, Sedentry Reminder, Bluetooth Sync, 4 Band GSM SIM, Notifications (Gold) to your Shopping Cart. The Iradish Y6 watch phone is an extraordinary cool electronic gadget that allows you to enjoy all your smartphone’s features straight from your wrist. Coming with an extremely low price tag this smart watch is the perfect electronic gizmo for young and old alike. With this Bluetooth smart watch you will always be connected to your friends and family, so no matter where you are, you will only be a phone call away from your loved ones. With its plug and play design all you have to do is plug in your SIM card and you’ll be ready to go. Packing a built-in camera this electronic accessory even allows you to snap pictures at any time. Featuring a built-in pedometer, sleep monitor, and sedentary reminder this phone watch is the perfect health accessory that motivates you to improve your lifestyle. With the Iradish Y6 Bluetooth smart watch at your wrist, you will be carrying around a personal trainer at any time – ready to motivate you and get you through those upcoming workouts to ensure that you’ll keep up with your current fitness plan. With its compact 1.54 inch display, this affordable smart watch brings along bright and detailed images that can be enjoyed even in full sunlight. Make and receive phone calls, send messages, and even receive social media notifications – this watch phone takes connectivity to an entirely new level. Coming with a light weight 350mAh battery this Bluetooth watch provides numerous hours of continuous usage time, allowing you to stay always connected and enjoy all its features throughout the day while eliminating the need to worry about battery life. Allowing you to sync the Iradish Y6 with both Android and iOS devices you can be assured that, no matter which phone you’re using, this watch phone will allow you to bring all your phone’s features onto your wrist. Coming with its own application this smart watch lets you receive and answer to social media updates instantly, taking away the need to physically have your smartphone at hand in order to be connected to the outside world. With its 32GB of external storage via a Micro SD card slot, you can store countless hours of music and media onto your watch – allowing you to carry around your favorite tracks where ever you go. The Iradish Y6 watch phone comes with a 12 months warranty, brought to you by the leader in electronic devices as well as wholesale electronic gadgets..
Arabic: - مشاهدة هاتف بلوتوث - Chinese Simplified: - 蓝牙手机手表 - Czech: - Bluetooth telefon hodinky - Dutch: - Bluetooth-telefoon horloge - French: - Montre téléphone Bluetooth - German: - Bluetooth Handy-Uhr - Hebrew: - שעון טלפון Bluetooth - Hindi: - ब्लूटूथ फोन देखो - Hungarian: - Bluetooth telefon néz - Italian: - Bluetooth telefono orologio - Japanese: - Bluetooth 電話の腕時計 - Korean: - 블루투스 휴대 전화 시계 - Malay: - Jam tangan telefon Bluetooth - Norwegian Bokmål: - Bluetooth telefon se - Romanian: - Bluetooth telefon ceas - Russian: - Bluetooth телефон часы - Spanish: - Reloj Bluetooth teléfono - Thai: - นาฬิกาโทรศัพท์ Bluetooth - Turkish: - Bluetooth telefonu izlemek - Vietnamese: - Điện thoại Bluetooth xem.